The church of Christ is correctly called the church of Christ for several reasons. Such designation is not a denominational name nor the only exclusive name by which the Bible refers to the church. But because Christ founded the church and because he is the very foundation of the church it is very appropriately called the church of Christ. In Matthew 16:18 Jesus said to Simon Peter, "And I say also unto thee, that thou art Peter, and upon this rock I will build my church; and the gates of hell shall not prevail against it." From this passage it is very obvious that Christ is the builder or founder of the New Testament church and that he calls this church his church. Any church founded by someone other than Christ is not Christ’s church. David, in the Old Testament, announced a great truth when he said, "Except the Lord build the house, they labour in vain that build it" (Psalm 127:1). In the New Testament we learn that the "house of God is the church of the living God" (1 Timothy 3:15). If the Lord did not build the house (church) those who did build it labored in vain. Jesus declared, "Every plant which my heavenly Father hath not planted, shall be rooted up" (Matthew 15:13). No one should be a member of any spiritual household, religious plant, or church which man was responsible for starting. One should be a member of the church Christ established! Not only is Christ the founder of the church but he is also the foundation of the church. In that same statement to Simon Peter cited earlier Christ said, "Upon this rock I will build my church" (Matt. 16:18). What was or is the rock on which the church of Christ is established? It is the bed-rock foundation fact that Peter had just acknowledged – namely, that Jesus is the Christ, the Son of the living God. In Matthew 16:16 Peter said to Jesus, "Thou art the Christ, the Son of the living God." Following this statement Jesus said that upon this rock he would build his church. The rock was not the apostle Peter or any other man; rather it was Christ and his divine relationship to God – the fact that he is God’s Son. The apostle Paul makes this abundantly clear when he states, "For other foundation can no man lay than that is laid, which is Jesus Christ" (1 Corinthians 3:11). Any church built on a man or some special religious doctrine or some form of church government is built on the wrong foundation and will not stand. The church our Lord established is built on him – on the fact that he is God’s Son. That is why every person who becomes a member of the church must confess his faith in Christ as the Son of God (Act 8:37). The church is said to be a spiritual house made up of lively or living stones. Before a person can be placed on Christ the foundation and made a stone in that house he must believe that Jesus is the Son of God (1 Peter 2:5, 6). The church Christ established and which is founded on him was started in the city of Jerusalem on the first day of Pentecost following the resurrection of Christ (Acts 2). The prophets had long predicted the coming kingdom of the Messiah (Isaiah 2:2-4; Daniel 2:44). This kingdom was not a physical kingdom but a spiritual one (John 18:36) and was realized in the founding of the church by Christ. After his resurrection Christ appeared to his apostles and said, "Thus it is written, and thus it behooved Christ to suffer, and to rise from the dead the third day: and that repentance and remission of sins should be preached in my name among all nations, beginning at Jerusalem" (Luke 24:46,47). Then in Acts 1:8, just before he ascended back to heaven, Christ said to the apostles, "But ye shall receive power, after that the Holy Ghost is come upon you: and ye shall be witnesses unto me both in Jerusalem, and in all Judea, and in Samaria, and unto the uttermost part of the earth." Observe in this statement that Jesus said the apostles would receive power (power to preach the gospel in all its fullness, resulting in the coming of the kingdom or church) when the Holy Ghost came upon them. In Acts 2:1-4 we find the Holy Ghost coming upon the apostles and their being empowered to preach the gospel in the languages of the people gathered in Jerusalem for Pentecost. As a result of the apostles’ preaching, people were pricked in their heart and asked what to do to be forgiven of their sins (Acts 2:37). They were instructed, "Repent, and be baptized every one of you in the name of Jesus Christ for the remission of sins, and ye shall receive the gift of the Holy Ghost" (Acts 2:38). "Then they that gladly received his word were baptized: and the same day there were added unto them about three thousand souls" (Acts 2:41). Thus, the kingdom or church of our Lord came with power (Mark 9:1). It was established in the city of Jerusalem in the year 33 A.D. by Christ upon the bedrock foundation truth that he is the Son of God. On every occasion thereafter when people heard of Christ, believed in him, repented of their sins, confessed Christ to be the Son of God, and were baptized for the remission of their sins, the Lord added them to his church. "And the Lord added to the church daily such as should be saved" (Acts 2:47). It is a great privilege to be a member of the church Christ established and of which he is the foundation. By being a faithful member of that church one can have eternal life in heaven when his life here on earth is over. On the other hand, it is dangerous to be a member of any church not founded by Christ and not established on him. There is no promise of eternal salvation by being a member of a church devised and established by man! Why take a chance with your soul? Is it scriptural to refer to the church as the church of Christ? Why? How many churches did Christ promise to build? What will happen to plants (churches) not planted by the heavenly Father? Is the New Testament church founded on some man, religious doctrine, religious practice, or form of church government? 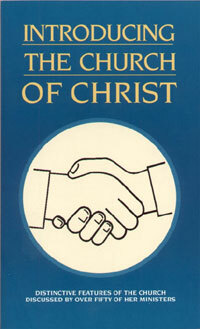 What is the foundation of the church of Christ? Can one become a member of the Lord’s church without confessing that Jesus Christ is the Son of God? Where was the church of Christ established? When? What does the Lord do with a person who hears the gospel, believes on Christ, repents of his sins, confesses faith in Christ, and is baptized for the remission of sins?